Lindsay's Book Chat: 'A Knight's Enchantment' published today! 'A Knight's Enchantment' published today! My historical romance, A Knight's Enchantment, is released today by Kensington Zebra. This is my third knight novel, the other two being A Knight's Vow and A Knight's Captive. They take place in different time periods and different places, but all have knights as their heroes. For me the appeal of a knight isn't his shining armour or his wealth. It isn't even the knightly code which he would be supposed to follow: too often in the middle ages, such ideas of courtesy and honour applied only to the nobility and no one else. But a knight as a protector - now that appeals. My heroines, too, are great rescuers. In A Knight's Enchantment, Joanna is striving to free her father from captivity and throughout the novel she 'rescues' the hero Hugh, prompting him to reconsider many part of his life and his relations with his family. Their early encounters are fraught, as neither is sure they can trust the other and Hugh especially makes wrong-headed assumptions about Joanna. He has his own powerful reasons for seizing her, but his self-justifications are flawed. Later he realises and admits this and they join forces. You can find more details, the 4-star Romantic Times review and an excerpt here. Congrats, Lindsay! I'm so happy for you! You know how much I love, yes! I love your Knights! Here's to millions of sales! 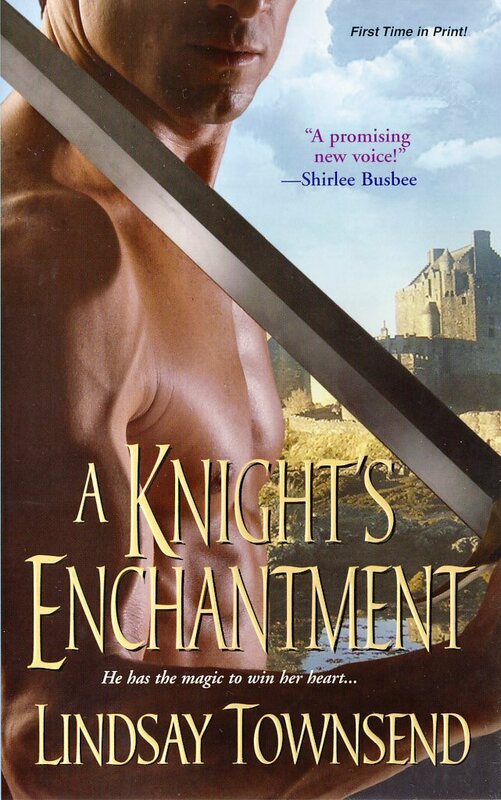 Oh yes, and I completely forgot to tell you how much I dearly love the Cover for A Knight's Enchantment! All your Knight covers are great. Congrats, Lindsay! I wish you much success. This is wonderful! So happy for you! Thanks, Kaye! I love the cover, too and I'd love millions of sales!